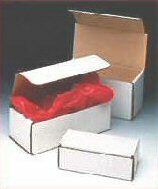 Our white crush-resistant corrugated mailers provide double walls of protection on the front and sides. These one-piece corrugated mailers ship and store flat to save space. Easily fold together in seconds to create a strong, professional looking package. Each corrugated mailer box is constructed from 32 ect-B oyster white corrugated.